I recently returned from Illinois, where I had an opportunity to share our new research into the impact of income tax changes on employers in Illinois. 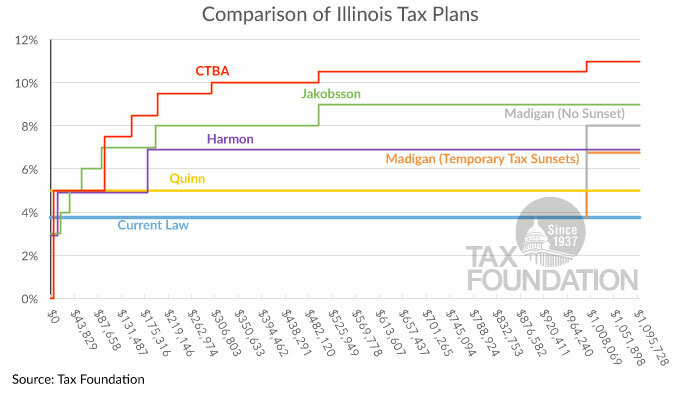 The first plans we covered, from Representative Jakobsson and the Center on Tax and Budget Accountability (CTBA), had top rates of 9 and 11 percent. Then House Speaker Michael Madigan (D) offered a plan for a 3 percent millionaire tax bracket. While I was there, Senator Don Harmon (D) released a rate schedule for a plan with a top rate of 6.9 percent. And in his budget address today, Governor Quinn called for an extension of the temporary 5 percent income tax, which is currently scheduled to drop to 3.75 percent in 2015. With so many plans, ranging from full progressive income tax schedules to high-earner taxes to different flat tax rates, I thought it could be helpful to offer a comparison. The chart below shows what the marginal tax rate is for each plan at each income level, up to $1,000,000. There are still some unanswered questions that make analysis of these plans difficult. It’s not clear if any of them will include inflation-indexing, or how they will address married couples filing jointly. There hasn’t been any revenue scoring of these proposals, either.